In late March, Moscow's Mosfilm studio launched the production of Russian-Chinese film “Viy 2. Journey to China.” A Chinese crew from Jackie Chan's JCE Movies Ltd along with lead actress Yao Xingtong, fight choreographer He Jun and cinematographer Man-Ching Ng are in Moscow for the production. RBTH went on set to get a closer look. “Viy 2” is a sequel to “Viy 3D”, a 2014 dark fantasy film loosely based on the Nikolay Gogol story Viy, which was one of the highest-grossing films in Russia that year. The plot of the sequel has no relation to Gogol's work and develops the story told in the first movie. 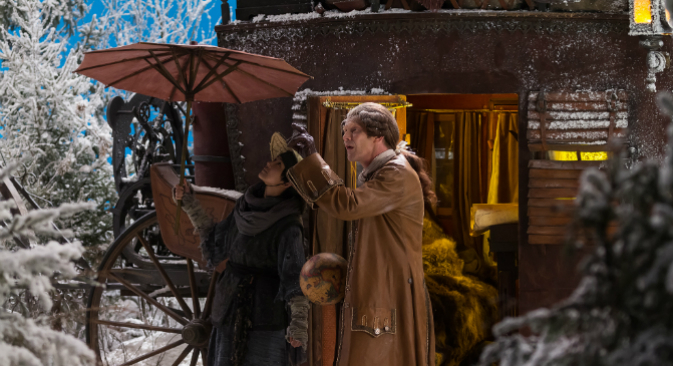 The protagonist, cartographer Jonathan Greene, portrayed by British actor Jason Flemyng, accepts a mission from Russian Tsar Peter I to map Russia's Far East. The Englishman embarks on a journey, which eventually takes him to China, where most of the action takes place. In Slavic mythology, Viy is a demon capable of killing people by looking at them. His eyes are usually covered by his long eyelids and lashes, which are lifted by his underlings using forks. The plot is mostly based on Russian and Chinese legends. The Slavic legend of Viy intertwines here with the Chinese stories of dragons and the myths about the origins of tea. The film's producers also promised to present their own version of the Grand Embassy of Peter I and of the legendary Man in the Iron Mask. The film is a joint production of two Russian companies, Russian Film Group and STV, and their Chinese partners. According to Russian Film Group producer Alexey Petrukin, the movie's mission is to promote not just Russian cinema, but Russian culture as a whole in the world. The film will be released in Russia, China and the West. “I believe our film will be interesting to everyone, since it is basically an international production: specialists from Russia, China, UK and Germany are all involved”, says director Oleg Stepchenko. “The movie will be presented at the Marché du Film in Cannes. Granted, it is not an American blockbuster, but we still expect to get good box office performance in Western countries too, not just Russia and China. Our partners are working on it too,” adds STV producer Sergey Selyanov. In 1697 Russian Tsar Peter I went to Western Europe with a year-long diplomatic mission. After returning, the ruler immediately began reforming the country along European lines, stopped wearing Russian clothes and distanced himself from his relatives. Some early Russian conspiracy theories even stipulated the man who returned from Europe was not the Tsar but an impostor. According to the producers, the funding mostly comes from private companies, although Russia's National Film Industry Support Fund did make some contributions too. The film's female lead will be portrayed by Chinese actress Yao Xingtong, who has previously collaborated both with Jackie Chan and fight choreographer He Jun. This time she will play three completely different parts – at the beginning of the film she will enact a young kung fu master, and in the course of the story she will transform first into a witch, and then into a Chinese princess. The actress believes both Russian and Chinese audiences would find the film interesting. “I think moviegoers in both countries will love it. This is the first joint production of Russia and China; plus, there are both martial arts and beautiful legends, which I think many will appreciate”, she says. The Man in the Iron Mask was the name attributed to a mysterious prisoner held in the Bastille. His real name is unknown, and his very existence is unconfirmed. According to one legend, the prisoner was a noble who bore a strong resemblance to a member of the court of Louis XIV of France, and thus was forced to wear an iron mask to hide his features. The lead Russian stuntman Alexander Solovyev says his team uses the occasion to expand their horizons. “Fights like that are something you don't usually see in our movies, so we can learn a lot of new tricks”, he explains. Yao Xingtong also appreciates the professionalism of Jackie Chan's stuntmen: “It is my second time working with He Jun and his team, and they really are experts in their field. In fact, I think that they are some of the best kung fu fight choreographers in all of China”. Fight choreographer He Jun is inclined to agree with Stepchenko. “Everyone we work with here knows their job perfectly, and everyone has their own special style. We have also learned much during the filming”, he says. As for understanding each other on the sets, both Russian and Chinese actors and directors are sure that the language barrier would not be an obstacle for cinema. In the course of the production all the members of both crews managed to find a common language and are now mostly able to communicate without interpreters. “We always use at least three languages when filming. Most of the time we don't even need interpreters at all. Cinema is all about emotion, and this is what unites us”, says Alexey Petrukhin. “We do have some language difficulties from time to time, and it is sometimes hard to communicate, but we don't always have to speak – we use the language of cinema,” confirms He Jun. Judging by the atmosphere that reigns on the set, everyone is enthusiastic about the production, and the crewmembers have become good friends. “The guys from Russian crew are professionals, and they love their job. They have a very different mindset, but they are very kind and friendly. They also work very thoroughly, and working with them feels great”, says Yao Xingtong. “It is the first time we visit Russia, and there are a lot of things we just don't know. These guys are really helpful”, He Jun adds. After having wrapped up filming in Moscow, the united crew went to Tunisia to continue the production. The shooting will go on in China this summer. The release is expected in the autumn of 2016. The producers hope that the film will be released simultaneously in Russia and China.